If you were there, you could have seen, possibly heard, but certainly not smelled Audi's R10 racer win the 54th Annual 12 hours of Sebring. Why, might you ask? Well, because this endurance race was won by a quiet, clean diesel-powered car that could trigger a new wave of interest and sales for such automobiles in the United States. Already strong sellers in Europe with a dominant percentage of the overall passenger car market in countries such as France, diesel vehicles have become renowned for providing their owners with many years of reliable, extended-range miles. In addition, fewer taxes are levied on diesel fuel at the pump there. Imagine a 700-mile range and 50-percent less spent per gallon. You would be silly not to go that way. The news keeps getting better as clean-burning fuels are about to penetrate the market globally. Already available in Germany and the Netherlands, a new formula diesel dubbed "V-power" by Shell is super clean. Tack on engine technology developments, the addition of particulate filters and exhaust processing and we believe that infamous diesel stink of yesteryear will become a long-forgotten memory. As for the traditional noise associated with diesel engines, that is also going away slowly but surely. 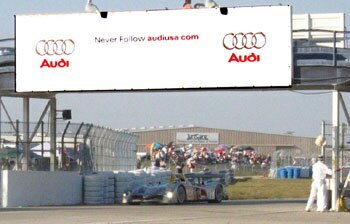 In fact, due to its low RPM range of operation (3000 RPM average), race fans did not get much of a warning as the Audi R10 approached at Sebring. The whirl of the twin turbos was more dominant. We had the chance to get behind the wheel of a 3.0-liter TDI-powered Q7 and A6 (cars available in Europe) fueled by the same Shell GTL diesel that propels the R10 and were pleasantly surprised. After warm up, the V6 delivered robust power and the gas gauge didn’t move too quickly. In 2004 we reported on the Pumpe Düse technology as test driven in the last generation Jetta. The V10 TDI Touareg has been continuously sold out and VW has not had any problems selling its diesel line-up of TDI Jettas, Golfs and New Beetles. Volkswagen and Audi are helping to lead the way in bringing clean, efficient diesel-powered cars to the United States, and with Audi's R10 racer, they're also well on their way to leading the next 24 Hours of Le Mans.